Members of Derry City and Strabane District Council fell silent as a mark of respect for “all civilian casualties throughout the world”, and particularly this week, for the victims of the Manchester Arena suicide bombing, after agreeing to send a letter of civic solidarity to the Mayor of Manchester Andy Burnham. 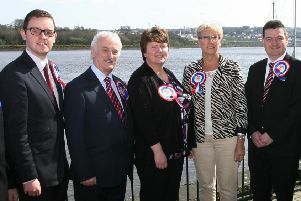 Councillors observed a minute’s silence during the monthly meeting of Derry City and Strabane District Council on Thursday after the Mayor, Alderman Hilary McClintock, proposed sending a letter to her colleague, Mr. Burnham to express her disgust at the atrocity on behalf of the citizens of the city and district. SDLP Councillor Martin Reilly expressed his party’s condolences to the victims of what he described as an “absolutely horrific” attack and noted that “many people from this city were involved in helping those affected by the carnage” and that it was fitting that the council should pay tribute to them. Sinn Féin Councillor Paul Fleming branded the bombing a “totally unacceptable attack on civilians during a concert” and noted that “every class and creed from across the world” that calls Manchester its home was affected. Independent Councillor Gary Donnelly described the attack as an act of “sheer unadulterated murder”. DUP Alderman David Ramsey observed that “we all have a lot of family and friends in Manchester”, before remarking that the attack brought back “terrible memories” for victims of the Troubles here. Independent Maurice Devenney echoed these sentiments saying the attack would have been painful for those who had lost loved ones to the IRA, specifically referring to the family of Inam Bashir, who lost his life in the London Docklands bombing of 1996. The councillors eventually rose having unanimously agreed to “observe a minute’s silence in relation to all civilian casualties throughout the world , being particularly mindful of the recent atrocitiy in Manchester”.